Lecturer, Lecturer Biotechnology, Lecturer Finance, Lecturer Marketing, Lecturer Economics, Lecturer Dietetics, Lecturer English, Lecturer Food Safety, Lecturer Botany, Lecturer Wildlife Management, Lecturer Mathematics, Lecturer Zoology, Deputy Registrar, Assistant Registrar, Executive Engineer, & Transport Officer. Get the Latest jobs opportunity from PMAS Arid Agriculture University Rawalpindi March 2019. 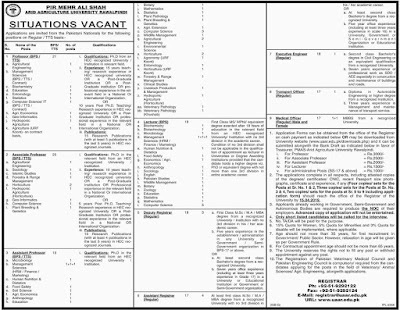 Candidates download Application Form from the Official websites of PMAS Arid Agriculture University Rawalpindi; http://www.uaar.edu.pk/career.php. All positions are on a regular basis as per the policy of the University of PMAS. If you are unemployed yet & want to get a suitable job of government organization, then you should apply to these above mention posts. Now, I will let you know about its further information below. You must be 35 to 65 Years old to apply for these jobs. Applications can be downloaded from the university’s website at http://www.uaar.edu.pk/career.php. Applicants need to pay the Rs. 3000/ for BPS-21 & Rs. 25000/ for BPS-20 & Rs.2000/ for BPS-19 & Rs.1500/ for BPS-18 in Bank Draft as in favor of Treasurer of the university. 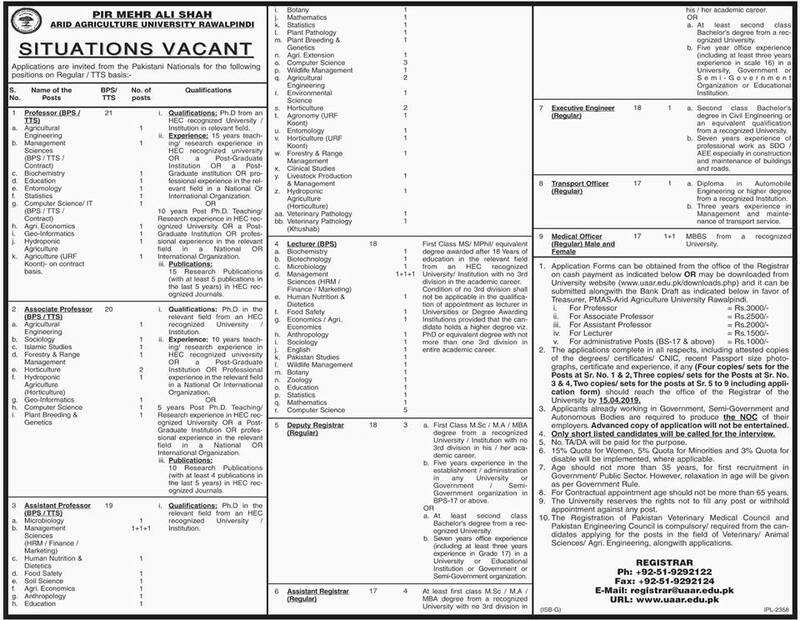 The advertisement can be seen on the Official website; http://www.uaar.edu.pk/career.php. Only shortlisted candidates will be kept amused for an interview. Candidates should bring all original documents at the time of interview. No TA/DA will be funded to any candidate for appearing in Test / Interview.